Western blot analysis of extracts from HeLa cells, transfected with 100 nM SignalSilence® Control siRNA (Unconjugated) #6568 (-) or SignalSilence® Atg4C siRNA I (+), using Atg4C Antibody #5262 (upper) or β-Tubulin (9F3) Rabbit mAb #2128 (lower). 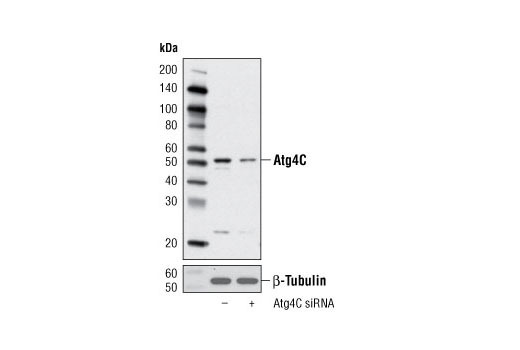 The Atg4C Antibody confirms silencing of Atg4C expression, while the β-Tubulin (9F3) Rabbit mAb is used as a loading control. Western blot analysis of extracts from various cell lines using Atg4C Antibody. 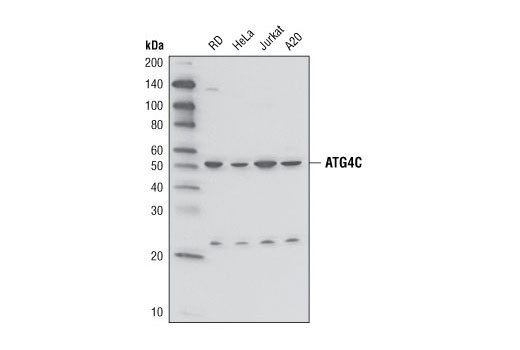 Atg4C Antibody detects endogenous levels of total Atg4C protein. A band of unknown origin is detected at 23kDa. The intensity of this band is reduced by treatment with Atg4C siRNA. Polyclonal antibodies are produced by immunizing animals with a synthetic peptide corresponding to residues surrounding Ser430 of human Atg4C. Antibodies are purified by protein A and peptide affinity chromatography. Autophagy is a catabolic process for the autophagosomic-lysosomal degradation of bulk cytoplasmic contents. Control of autophagy was largely discovered in yeast and involves proteins encoded by a set of autophagy-related genes (Atg) (1). Formation of autophagic vesicles requires a pair of essential ubiquitin-like conjugation systems, Atg12-Atg5 and Atg8-phosphatidylethanolamine (Atg8-PE), which are widely conserved in eukaryotes (2). Numerous mammalian counterparts to yeast Atg proteins have been described, including three Atg8 proteins (GATE-16, GABARAP, and LC3) and four Atg4 homologs (Atg4A/autophagin-2, Atg4B/autophagin-1, Atg4C/autophagin-3, and Atg4D/autophagin-4) (3-5). The cysteine protease Atg4 is pivotal to autophagosome membrane generation and regulation. Atg4 primes the Atg8 homolog for lipidation by cleaving its carboxy terminus and exposing its glycine residue for E1-like enzyme Atg7. The Atg8 homolog is transferred to the E2-like enzyme Atg3 before forming the Atg8-PE conjugate. During later stages of autophagy, Atg4 can reverse this lipidation event by cleaving PE, thereby recycling the Atg8 homolog (6). Atg4C-deficient mice display a tissue-specific decrease in LC3 lipidation only when under stressful conditions such as prolonged starvation. Mutant mice also exhibit increased susceptibility to the development of chemical carcinogen induced fibrosarcomas suggesting that Atg4C may contribute to events associated with tumor progression (7). Ohsumi, Y. (2001) Nat Rev Mol Cell Biol 2, 211-6. Kabeya, Y. et al. (2000) EMBO J. 19, 5720-28. Kabeya, Y. et al. (2004) J. Cell Sci. 117, 2805-12. Mariño, G. et al. (2003) J Biol Chem 278, 3671-8. Sou, Y.S. et al. (2008) Mol Biol Cell 19, 4762-75. Mariño, G. et al. (2007) J Biol Chem 282, 18573-83.